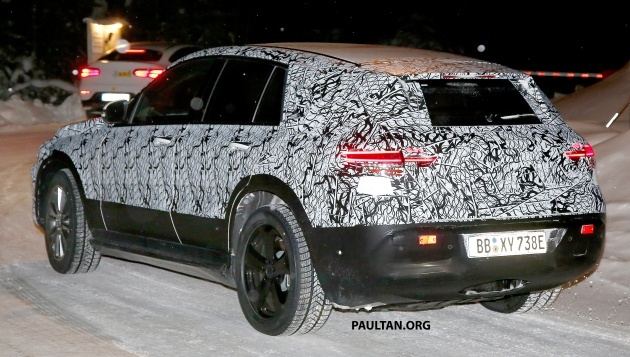 Mercedes-Benz’ testing of its all-electric vehicles have moved to the next stage, with the upcoming EQ C fully electric SUV now spotted testing in Sweden in its production body. 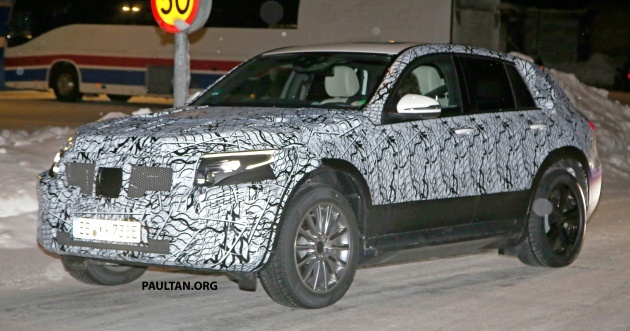 A previous development mule was seen wearing the bodyshell of a GLC instead. Essentially paving the way for a production version of the Generation EQ concept, which also marked the birth of the Mercedes-Benz electric vehicle sub-brand. The EQ C will be underpinned by the German automaker’s EVA scalable EV platform, which itself is based upon the firm’s MRA (Modular Rear wheel-drive Architecture) platform – body, suspension and basic electrical components. Motive power is tipped to be from either a 402 hp electric motor driving the rear wheels only, or which is supplemented by a 122 hp or 204 hp motor driving the front wheels. Energy will come from a 400 kg battery pack, and total range of at least 500 km on a single charge. Features such as adaptive suspension, regenerative braking and electric torque vectoring are all tipped to be standard equipment on all EQ models to come, according to our spy photographer sources. As for the bodyshell itself, we can see that the EQ C sports a shape that still largely resembles that of the GLC, although certain cues such as the headlamp detail point towards a new design direction more akin that of the Generation EQ concept. Around the back, the tail lamps still have a strong GLC flavour about them with their slim, horizontal layout, however further aesthetic detailing should be revealed later on when the EQ C sheds more of its camouflage. The interior has yet to be seen, however it will almost certainly be far more restrained than the Generation EQ concept’s; those individual rear buckets will surely yield to a conventional bench. Also in the EQ pipeline – or pylon, figuratively speaking – is a smaller model in the form of the EQ A, though that remains at the concept stage for the time being. Mercedes trying to make the ultimate Taxi car once again.